'Mixed Letter / Legal' Copy: With paper size sensing of documents in the ADF or flatbed, the output paper size is printed on the corresponding paper size such as letter to letter or legal to legal. The output can also be automatically scaled to fit one paper size such as a letter and legal page mix to all output as letter size. Simple Network Management Protocol (SNMP) v3, Secure Sockets Layer (SSL*), IP Security (IPSec) and 802.1x authentication and user authentication(with single sign-on) provide security measures for multifunction communications and data encryption. Confidential printing with enhanced personal ID number (up to 10 digits) management including lockout, job expiration, and invalid PIN protection. *This product includes software developed by the OpenSSL Project for use in the OpenSSL Toolkit. A powerful 514 MHz processor and standard 128MB RAM (expandable to 640MB) for fast copying or printing with up to 43 ppm coupled with a time to first page as quick as 8.5 seconds means less wait-time for users. 200,000 page one-time maximum monthly duty cycle provides departmental workgroup support. 'Job Cancel': Cancel a print, fax or network job from the job listings using the Lexmark e-Task touch screen icon. Specialised and general office copy, fax, scan and print is consolidated on one multifunction printer supporting labels, heavy media, recycled media and specialty forms. 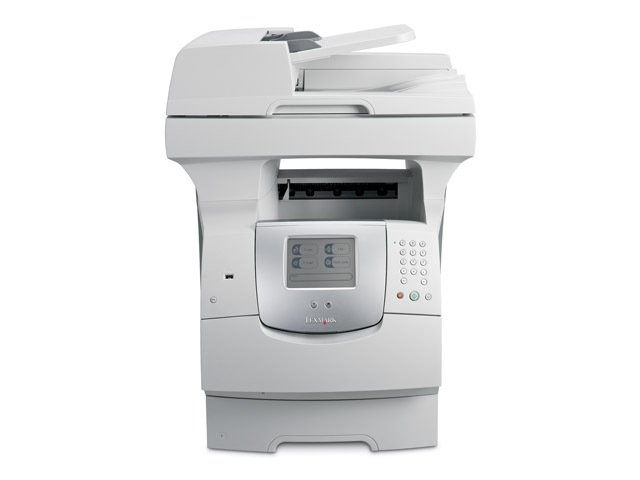 This MFP can be easily tailored to an array of business output application needs through the selection of input paper handling options, wireless or fiber network connections, and unique optional application solutions for PDF, bar code or encrypted data printing.